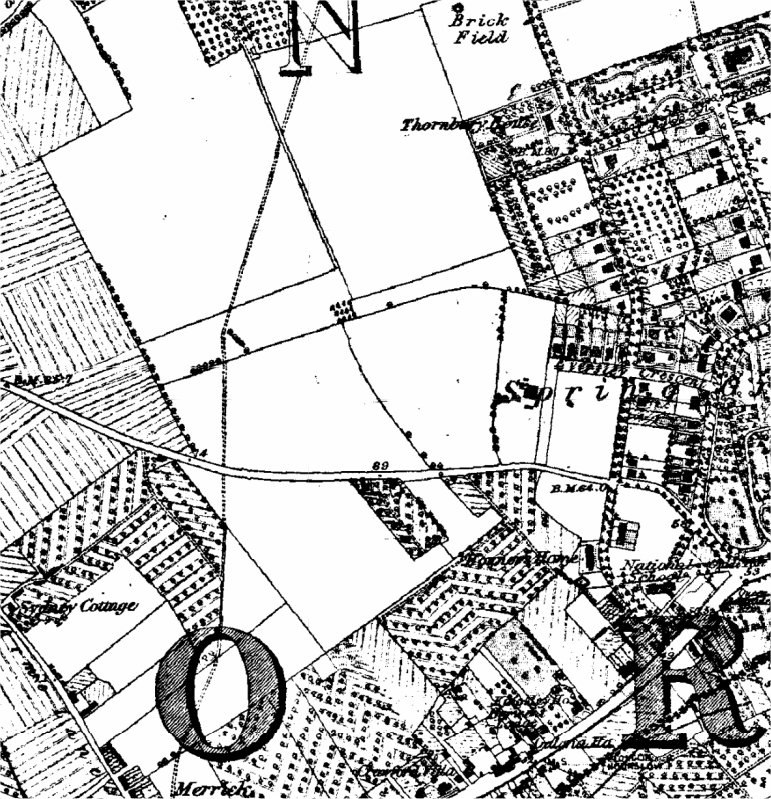 The name “Spring Grove” originates from the name of a house built by Sir John Offley in 1645 just north of the Great Western Road (now the London Road), which was the main Turnpike from London to Bath. The house was leased in 1780 to the eminent botanist and explorer Sir Joseph Banks after his voyage to the South Pacific on The Endeavour with Captain James Cook. In 1791 he also rented land around the house and purchased the house and estate in 1808. A strain of apple called “Spring Grove Codlin” was named by Banks. Joseph Banks wrote that he thought the name “Spring Grove” came about because a spring arises in a small grove in the area. Spring Grove House still exists within the grounds of West Thames College. The house and estate changed hands several times until it was purchased by Henry Daniel Davies in 1850. Davies was a property developer and laid out plans for an impressive estate of roads and large houses surrounding Spring Grove House. He built St. Mary’s Church and a number of large houses on Osterley Road, Thornbury Road, The Grove and Eversley Crescent. Information from the “History of Spring Grove” by Gillian Morris. Spring Grove was one of the most ambitious middle-class projects, and is said to have been chiefly designed for retired army officers. It was laid out in the early 1850’s, a church was built in 1856, and in the same year the rapid rise of the district was noted as a remarkable result of the new railway system. 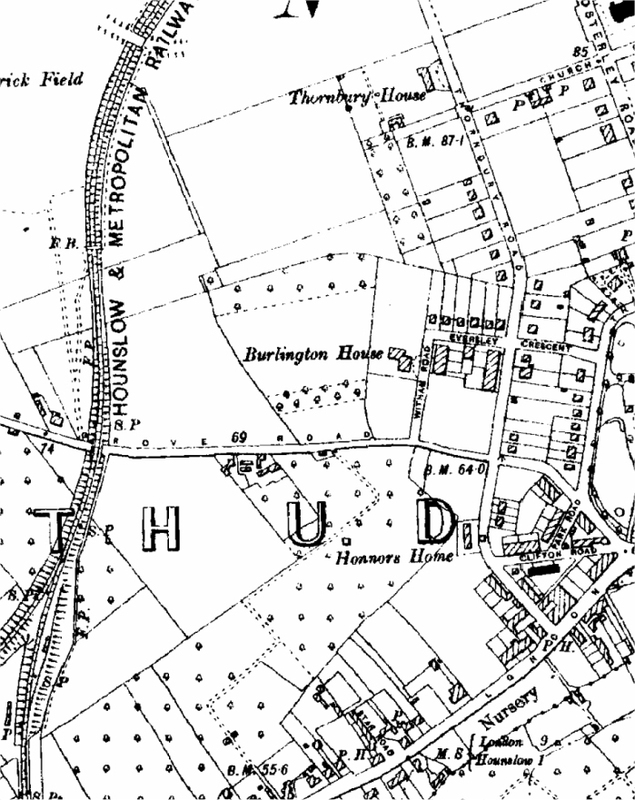 The good beginning was soon over: by 1865 only a few villas, including Thornbury House (now Campion House), where H. D. Davies, the promoter of the estate, lived, stood in their gardens along the roads round the church, though there was a rather larger number in the Grove. Very few houses of the original type were added to the estate later and though a number of retired soldiers seem to have lived there at first, the failure of the project was implicitly acknowledged in 1888. Close by, the International College (opened in 1867) represented another plan which never fulfilled the original hopes: the building, which was in the Gothic style, was taken over in 1890 by the Borough Road Training College. 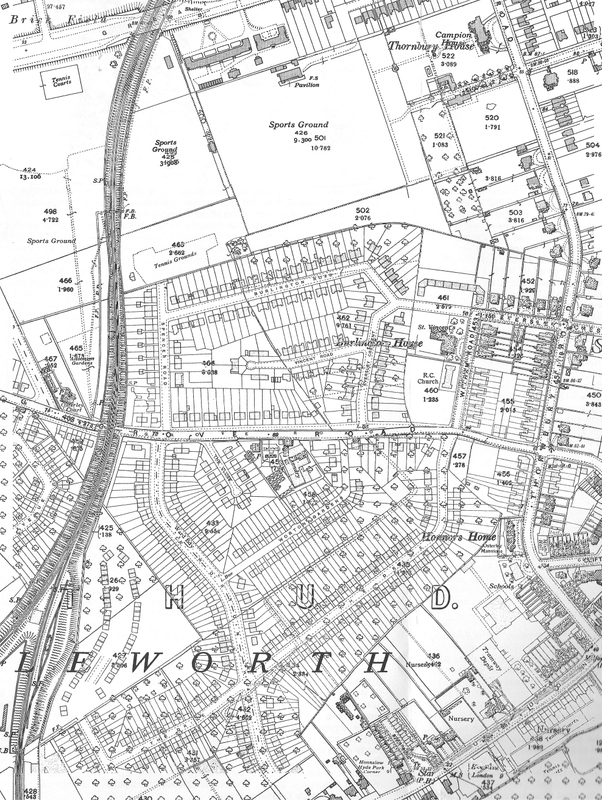 To the south of Spring Grove (now Isleworth) Station, Woodlands was a slightly humbler version of Spring Grove: the houses had gardens but many were semi-detached. It was first developed at about the same time but managed to sustain its progress more steadily later. It received its church just after Spring Grove. 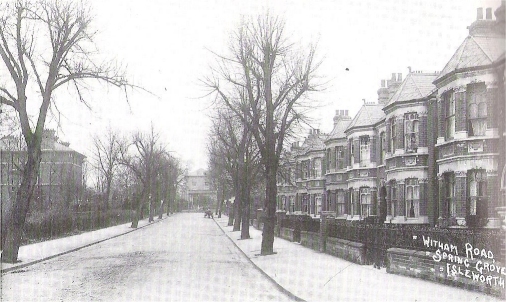 Picture of Witham Road 1913 from the book “Isleworth” by Mary and Kevin Brown. 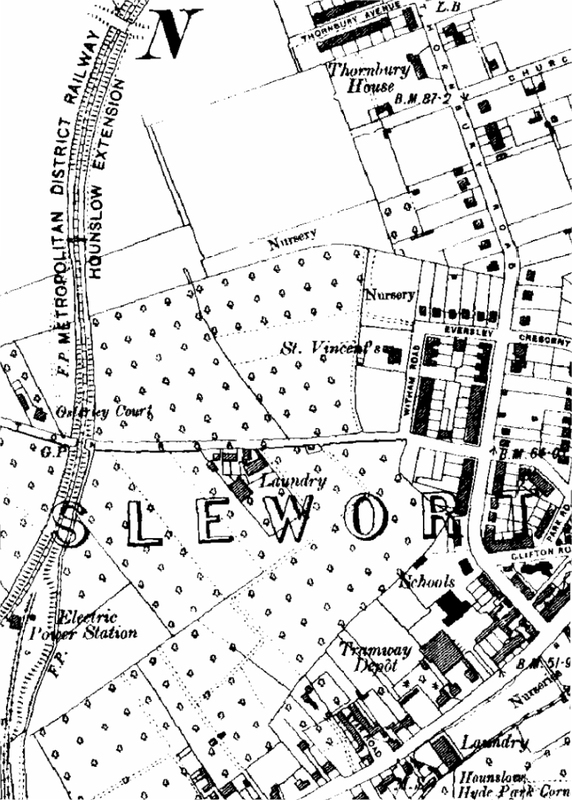 (The numbers below the plot numbers on these old maps is the acreage.) 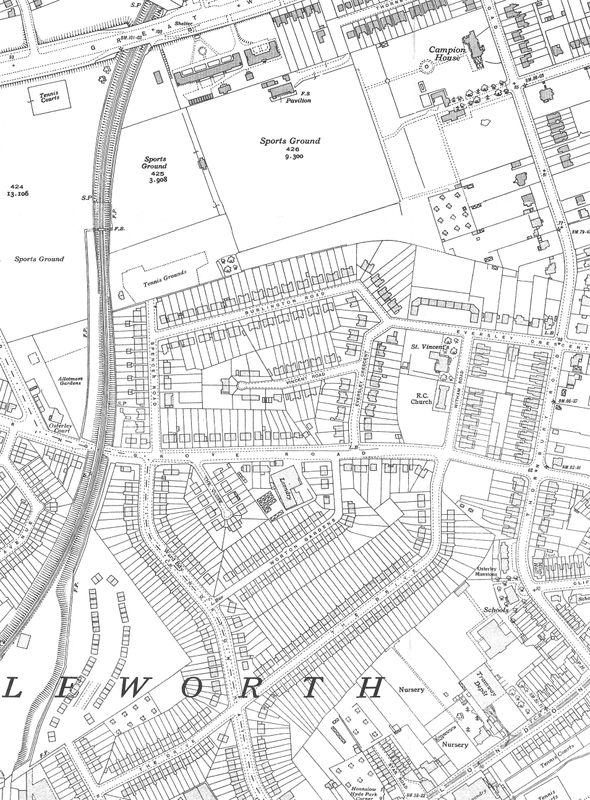 It can be seen from the above map that the only houses in the SGRA area dating from before 1894 are the large houses on the north side of Eversley Crescent where Ashton House school is, the 3 pairs of semi-detached houses at the north end of Witham Road (numbers 27-37) and the matching pair on Eversley Crescent (numbers 39 and 41). 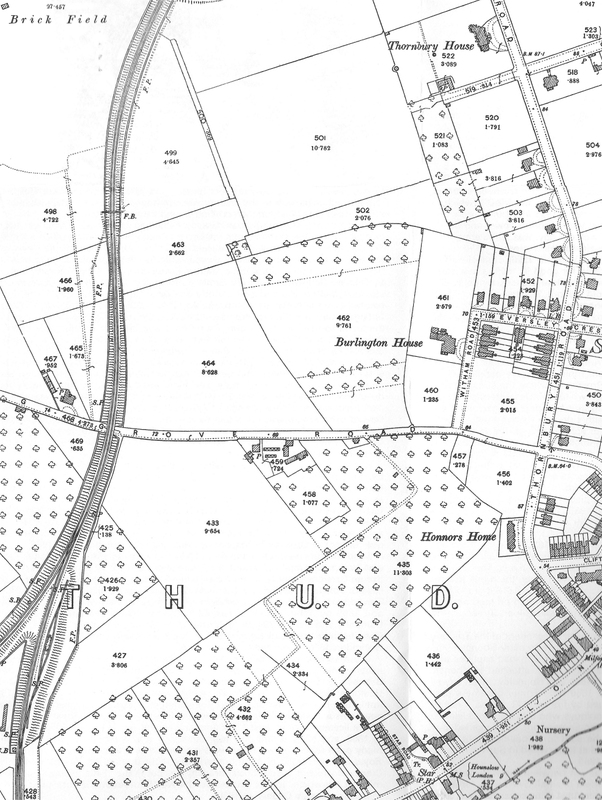 The only major developments in the area since 1935 have been the extension of Spencer Road, the replacement of the Spring Grove Laundry with Herbert Place and Copper Beeches replacing the old Burlington House. 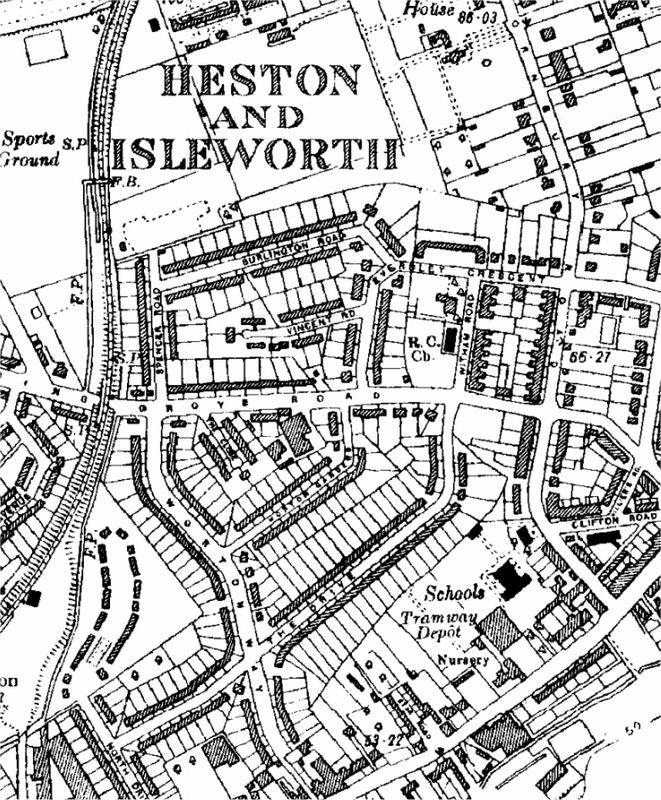 There have also been quite a number of individual new dwellings squeezed into existing gaps and gardens.